Volunteers Wanted at IMF RSPB. The view from the hide at Inner Marsh Farm RSPB, Feb 2008 © Richard Smith. The RSPB at the Dee Estuary Nature Reserve are looking for volunteers for various jobs. The first requirement is for help in the reception area at Inner Marsh Farm. The RSPB are looking for people who are willing to greet visitors in a friendly manner and are able to talk easily to the general public. Some knowledge of wildlife, especially birds, would be helpful but not essential. The next requirement is for voluntary wardens to patrol the track between Denhall Lane and Burton Point. This will be a similar job to the voluntary wardens at Neston Reed Bed and Point of Ayr, it will be necessary to chat to visitors about the birds but also to try and persuade people to keep to the track and not stray on to the marsh. In particular the RSPB want to stop disturbance of sheep and lambs, as well as wildlife, from out of control dogs by persuading their owners to keep them on a lead. This track is, of course, an excellent place to birdwatch with loads of birds on the marsh - Short-eared Owls, Hen Harriers and wildfowl in the winter, and Wheatears, Whinchat and warblers during migration. If you are interested or need more details contact Stuart Taylor either by email - Stuart.Taylor@rspb.org.uk, or by phone - 07966 645218. 10 years ago the maximum number of Common Scoters found in the seas off this country was around 37,500, or so it was thought. Aerial surveys carried out since then have revealed a very different picture with numbers in Liverpool Bay alone in the region of 60-70,000. The reason for the discrepancy is because many Scoters are located off shore out of sight of land and these are inevitably missed with any land based survey. These aerial surveys in Liverpool Bay have been carried out because this is a prime area for Windfarm development and as part of the process the energy companies are obliged to carry out comprehensive Environmental Impact Studies. The surveys have been performed by Wildfowl and Wetlands Trust Consulting under the guidelines of Countryside Council for Wales (CCW), Natural England and others - so they are a reliable and independent source of information. Important numbers of Red-throated Divers have also been found in Liverpool Bay and, together with the Scoters, this qualifies the area as a Special Protection Area (SPA) under the EU Birds Directive. A Common Scoter coming ashore at Hilbre © Mark O'Sullivan. The exact area the proposed Liverpool Bay SPA will cover has yet to be finalised but will include all the areas where Scoters congregate during the winter, these are shown in the map below. As you see the map above also includes the location of the windfarms within Liverpool Bay, some of which have not yet been built. These windfarms do pose a potential threat to the Scoters, not so much from the turbines themselves as the birds normally fly well below turbine height, but from disturbance. As Scoters are easily disturbed it is thought that just the presence of the turbines will mean they will vacate the area, and boat movements during the building and maintenance of the windfarm will cause greater disturbance. The only proposed windfarm which has significant numbers of wintering Scoters currently within its area is Shell Flat off Blackpool, which is why the RSPB and others are vigorously opposing it - so far successfully. One Chairman of an energy company was heard to remark that his plans for windfarm expansion was being held up because of 'some bloody duck'! This species breeds in Scandinavia and it is very likely that when they leave North Wales to breed in late winter/spring the whole flock located off Llanddulas moves due north, right through Gwynt-Y-Mor. The return journey southwards in the autumn is even more of a concern as we feel Gwynt-Y-Mor will act as a massive barrier with birds moving well to the west or east, or even turning back, from their preferred wintering area off Llanddulas. Between 10,000 and 30,000 birds will be affected. These migrate in March and April through Liverpool Bay to Seaforth (and onwards to the Baltic), at this time this area is the most important site in the country for this species. Counts at single sites include 628 past Hilbre on March 20th 2006 and 477 at Seaforth on April 21st 2006. Both spring and autumn migration takes place through Liverpool Bay, many of these birds are flying to and from the colony at Shotton (762 pairs in 2007) which is one of the top three largest in the UK, and Seaforth which had 170 pairs in 2006. A large post-breeding gathering takes place at Seaforth which in 2005 amounted to 2,010 birds - the highest count in the country that year. These post-breeding birds then migrate back out through Liverpool Bay. There is a large post breeding gathering on the Dee Estuary, many of which are thought to come from the large colony at Cemlyn Bay, Anglesey, and thus have to fly through Liverpool Bay to reach here. The Dee Estuary SPA is the third most important site in the UK for post breeding Sandwich Terns with typically over 1,000 present. These post-breeding birds then migrate back out through Liverpool Bay. This Amber Listed species has a colony at Gronant, the only one in Wales. In 2005 the max WeBS count on the Dee Estuary SPA (including Gronant) was 411, easily the highest count in the UK for that year. The five year mean of 318 is also the highest in the UK. 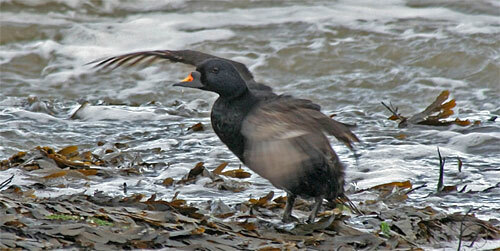 To get to and from Gronant this species migrates through Liverpool Bay. If you look at the map above you will see that the most likely migration route into or out of Liverpool Bay, a straight line from north of Anglesey to the Dee Estuary and Seaforth (next to the Mersey mouth), goes straight through Gwynt-Y-Mor. This is DECG's concern. We don't know if this is the route the gulls and terns actually use, or how much the birds are at risk if they do fly through the windfarm area. But that is the point - we don't know! We feel it is up to CCW and RSPB to force the Energy companies to carry out the necessary survey work and research to find out before Gwynt-Y-Mor is given the go ahead. After all, these are internationally important numbers of birds protected by EU law! Now to get back to Common Scoters and the Dee Estuary/North Wirral. Usually we just see the occasional small flock flying along the horizon, perhaps 20 birds or so in classic arrowhead formation. But this spring (2008) has been exceptional with a large flock of up to 5,500 (a record high for our area) stationed off Meols/Leasowe Lighthouse during April and early May, easily observable from land. A flock this size is spectacular, like a huge black cloud when they all take off and a huge black raft when they are on the water. Numbers have been increasing in recent years as can be seen from the graph below. The large flocks seen in 2001 and the last three years are probably part of the North Wales wintering population drifting eastwards. The big flock in 2001 was off Gronant, in 2006 and 2007 they were off Point of Ayr and the mouth of the Dee estuary, and this spring they were off North Wirral - so they appear to be coming further east each year, they are obviously finding plenty to eat out there. It's interesting that the presence of the North Hoyle and Burbo Bank windfarms haven't deterred these birds from coming here although I haven't seen any actually among the turbines. However, recent studies at the Horns Rev windfarm in Denmark showed that after initial desertion by Common Scoter within the windfarm footprint they were seen to return in 2007 in greater numbers than before it was built, so perhaps we shouldn't worry too much about their impact! 1. BTO Migration Atlas, 2002. 2. 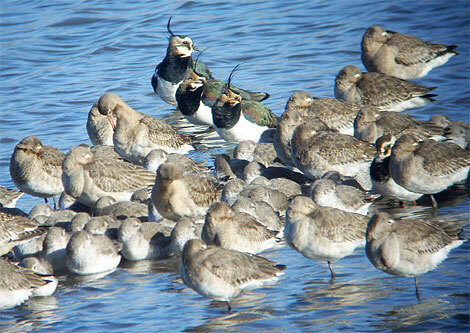 Waterbirds in the UK 2005/06, The Wetland Bird Survey. 3. Cheshire and Wirral Bird Reports 1980 to 2006. 4. Hilbre Bird Observatory Reports 2004, 2005 and 2006. 5. Lancashire Bird Report 2006. 6. Dee Estuary WeBS Annual Report, 2006/2007. 7. Merseyside Ringing Group Annual Report 2006. 8. Little Tern Report Gronant 2007, Denbighshire Countryside Services. 9. North-East Wales Bird Report 2004-2006. 10. Clwyd Bird Reports 1980 to 2003. 11. Appropriate Assessment with Regard to Gwynt-Y-Mor, BERR, March 2008 - DRAFT. 12. Aerial Surveys of Waterbirds in Strategic Wind Farm Areas: 2005/06 Final Report. 13. Aerial Surveys of Waterbirds in Strategic Wind Farm Areas: 2004/05 Final Report. 14. Environmental Statement for Gwynt-Y-Mor, npower, 2005. 15. 2007 and 2008 data given to me direct, including from Hilbre Bird Observatory. Apart from the gale on the 22nd June was a pretty quiet month, both bird and weather wise. The gale blew at least 800 Gannets past Hilbre, an unprecedented number for June and the second highest ever count for Hilbre. In much quieter conditions on the 29th there were still 165 off Red Rocks. The gale also brought 79 Manx Shearwaters past Hilbre with 33 off Gronant on 25th. Other sea-birds included 2 Arctic Skuas at Red Rocks on 14th and a drake Eider at Hilbre on 22nd. The max count of Common Scoter was 78 flying west at Gronant on 25th. 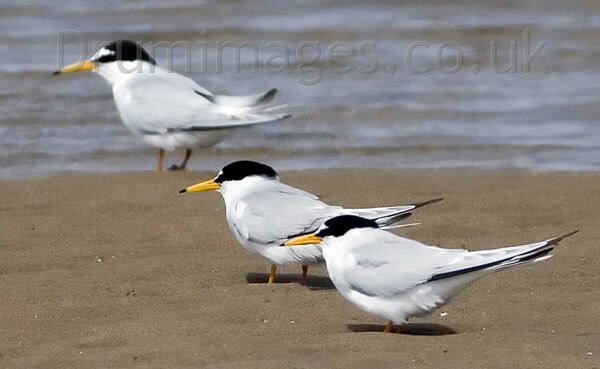 Little Terns at Gronant, June 11th, © Damian Waters, www.drumimages.co.uk . There are about 100 pairs of Little Terns breeding at their colony at Gronant this summer, a good number. The gale on the 22nd followed by torrential rain four days later won't have helped them - but it's not been as bad as last year, they managed to fledge 100 chicks in 2007 despite the appalling weather. At the Common Tern colony at Shotton there are 624 pairs, well down on the record 762 pairs last year. 750 Knot, most in non-breeding plumage, flew past Red Rocks on 22nd. A good June count for the Dee Estuary. Single summer plumaged Curlew Sandpiper (Red Rocks) and Bar-tailed Godwit (Heswall) were a glorious sight. An early returning Whimbrel was at Point of Ayr on 22nd. Single Greenshanks at Inner Marsh Farm and Heswall were also early, but the four Spotted Redshank at Inner Marsh Farm on the 28th were more expected. It was a disastrous breeding season for the Avocets at Inner Marsh Farm with all the chicks taken by predators. It has been a good spring for Ospreys but two heading north over Hilbre on the 1st were very late, obviously non-breeding birds. A Spoonbill turned up at Inner Marsh Farm on the 13th, it or another was reported a further four times towards the end of the month. Many thanks go to Steve Williams, Chris Butterworth, Peter Williams, David Haigh, Charles Farnell, Richard Steel, Dave Wild, Damian Waters, James Astley, Kevin Smith, Dave Harrington, Phil Woollen, John Smerdon, Alan Duckers, Chris Wilding, Jane Turner, Dave Edwards, Ken Roberts, David Lee, Philip Barnett, Jon Greep , John Mackinnon, Dave and Emma Kenyon and the Hilbre Bird Observatory for their sightings during June. All sightings are gratefully received. July is the month for terns. Sandwich Terns will increase rapidly in numbers during the first two weeks reaching at least 1,000 birds. See them either at their high tide roosts at Gronant, Point of Ayr, West Kirby and Hoylake, or at low tide on the sand banks next to Hilbre - the whole of the outer estuary will be filled with their cries. Although the Little Terns don't finish breeding until early August we always get an influx of birds around the third week of July, probably second year birds and/or failed breeders from other colonies. Expect to see 300 to 400 birds on the beach at Gronant which will include the first of this year's fledglings. Common Tern counts will also increase but later than the Sandwich Terns, they normally peak in August. July can also be good for scarcer terns such as Black or Roseate, or even a White-winged Black Tern or two. Other sea-birds will also increase in numbers with Black-headed and other gulls present in their thousands, look out for Mediterranean Gulls among the throng. With all these gulls and terns it is inevitable that there will be the attendant Arctic Skuas, last year was particularly good for this species - look for them at Point of Ayr, Hilbre and Red Rocks at high tide. If we are lucky a Great Skua or two might also turn up. Wader numbers will build up during the month with Curlews and Redshank returning in their thousands, but look out also for Grey Plover, Dunlin and Sanderling - all looking resplendent in their summer plumage. Scarcer waders will include Whimbrel, Greenshank, Spotted Redshank, Green Sandpiper and Common Sandpiper. One particular species to look out for towards the end of the month is Black-tailed Godwit; Inner Marsh Farm is a major staging post for birds returning from Iceland after breeding, max count last year was 1,850. The colour ringing scheme shows that many of these birds continue on south, one bird seen last year at IMF in July had been ringed in France and another in Portugal. Little Egrets will increase rapidly post-breeding, dusk at Inner Marsh Farm can be an amazing sight as they come into roost. Marsh Harriers will be on their way south and it is likely that one or two will hang around in the estuary. Fewer Ospreys are seen late summer than on their way north in spring, but we might get the odd one or two passing over. 4th July, 13.01hrs (BST), 9.3m. 5th July, 13.50hrs (BST), 9.3m. Thursday 9th July, 6pm – 9.30pm, Sunset Walk to Hilbre. Join the Ranger and cross the sands to discover the wildlife and history of the Hilbre Islands Local Nature Reserve. This 4-mile walk of 4 hours is ideal for first time visitors and suitable for all the family to enjoy, although some people may find the walk strenuous in places. Warm waterproof clothing and suitable footwear are essential. (Wellies are recommended). Sorry no dogs. There is a £1 charge per person for this event. Booking essential, 0151 648 4371/3884 or book on-line. Sunday 13th July, 10.30am – 3.30pm, Through Dales and Woods. Join the Rangers and members of Wirral Wildlife on a summer stroll through heathland, woodland, along parts of the Wirral Way and along the shore of the Dee Estuary. Suitable clothing and footwear are essential and a packed lunch is recommended. This event is suitable for all the family to enjoy. Sorry no dogs. No need to book. Meet at Cleaver Heath Local Nature Reserve Car Park, Oldfield Road, off Telegraph Road, Heswall. Thursday 17th July, 10am – 3pm, North Wirral Coastal Park Task Day. Join the Rangers, members of the Friends of North Wirral Coastal Park and other volunteers and undertake a day of conservation work to improve the habitats along Wirral’s coast. Booking essential, ring 0151 678 5488. Saturday 2nd August, 2pm start, Silent Hunter. Join Steve Harris from the Wirral Barn Owl Trust and learn more about the conservation of these charismatic birds and the work being undertaken by volunteers to ensure their survival at this illustrated afternoon talk in the Wirral Country Park lecture theatre. Thursday 7th August, 6pm – 9.30pm, Sunset Walk to Hilbre. Sunday 17th August, 9am start, Mud n’ Marsh. Join the Rangers and the RSPB Wardens at a premier birdwatching site on the internationally important Dee Estuary. Thousands of waders and wildfowl feed where the mudflats meet the marsh and as the tide floods in they form tighter and tighter flocks as they move in search of suitable roosts, alerting birds of prey including Peregrine Falcons and Merlins. Come along to Banks Road Car Park, Lower Heswall to witness this wildlife spectacular.